Barasat Kali Puja Themes in 2016, Most popular Kali Puja pandal names with 2016 Theme details, Must visit Kali Puja pandals of Barasat in 2016, Barasat Kali Puja Guide Map with Location. Are you looking for which Kali puja pandals in Barasat comes up with which theme in 2016? Do you want to know what are the themes of various popular Kali puja Pandals of Barasat in 2016? Here are the 2016 Themes of few most popular Kali puja Pandal names of Barasat (North Kolkata). This Kali puja Pandals of Barasat should be in your list of watching this year. KNC Regiment Barasat 2016 Kali Puja Theme – KNC Regiment Kali Puja Pandal Theme is ‘Buddhist Monastery’ / ‘Buddha Temple’ of Thailand. It’s a must visit Kali Puja Pandal of Barasat. Visit and get a flavor of Thailand’s famous Buddhist Temple in Barasat (Kolkata). 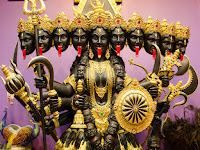 Barasat Pioneer Athletic Club 2016 Kali Puja Theme – One of the most popular Kali Puja Pandals of Barasat and comes with unique theme attraction. This year, Barasat Pioneer Athletic Club’s Kali Puja Theme is ‘Niagara Water Fall’. Yes, the huge pond is used to create water fall and inside a cave there is Bhairabi Kali Idol. Pioneer Athletic Club is situated very close to Barasat Railway Station. Barasat Bidrohi Sangha 2016 Kali Puja Theme Pandal – Barasat Bidrohi Sangha brings a piece of Vellore (South India) in Barasat. Yes, they are presenting ‘Vellore Sripuram Golden Temple’ this year. Don’t miss to watch Sripuram Swarna Mandir of Vellore at Barasat Bidrohi Sangha Kali Puja pandal. Barasat Nabapally 2016 Kali Puja Theme – Recently, Mother Teresa acknowledged with ‘Saint’ at Vatican City of Rome. This is the theme of 2016 Nabapally Sarbojanin. Yes, they are coming up with Vatican City of Rome along with St. Teresa event. Barasat Sandhani Kali Puja Theme 2016 – ‘Nirobe Bondi Saisab’ is the Theme of Barasat Sandhani. It’s a theme with great message to all parents. Here are only few pandal names are mentioned of Barasat area. But, there are many more good pandals to see in Barasat & Madhyamgram area of North Kolkata. Barasat - Madhyamgram Administrative department has launched a Kali Puja Guide with Map for the people interested in visiting & watching the great works of various Kali Puja Pandals. People can download 2016 Barasat & Madhyamgram Kali Puja Guide Map mobile application from Google App Store. Not only the names and locations of famous Kali Puja Pandals are listed in the Mobile App, but also which roads will be block for transportation and which road to follow mentioned in this android mobile application. ISKCON will be celebrating Rath Yatra Mela in Kolkata between 21st June & 29th June 2012. Let’s check out the details on ISKCON Rath Yatra Mela which is going to happen at Kolkata. • ISKCON Rath Yatra Mela Kolkata 2012 Date Schedule: - 21st June 2012 – 29th June 2012. • 2012 ISKCON Rath Yatra Mela Kolkata Entry Timings: - 4:30pm to 8:30pm. • Entry Ticket price of ISKCON Rath Yatra Mela Kolkata 2012: - Free entry for all. • ISKCON Rath Yatra Mela Kolkata 2012 Venue & Location address: - TAI Brigade Ground, Opposite Park Street Metro Station, Kolkata. • ISKCON Rath Yatra Mela Kolkata 2012 Organizer details: - International Society for Krishna Consciousness (ISKCON) [3C Albert Road, Near Minto Park, Kolkata-17 | Phone number: 033-2287-3757]. • Details of ISKCON Rath Yatra Mela Kolkata 2012: - The 2012 ISKCON Rath Yatra Theme is "Hare Krishna's in Russia" to highlight the struggle for Krishna Bhakti in Russia by the Vaishanavs in Russia. ISKCON Kolkata Rathyatra will start its journey at 9:30 am on 21st June 2012. Paschimbanga Chief Minister Mamata Banerjee is going to inaugurate the ISKCON Rathyatra 2012 at Park Circus Maidan (Kolkata) where from the Chariot (Rath) will reach Brigade Parade Ground. The main gate of Rathyatra Fair in Kolkata Brigrade Ground set up like the Saint Basil's Church of Moscow and the Puri Jagannath Temple setup for the Jagannath Ji as well. Hare Krishna's Photographies in Russia will be exhibited at the Rathyatra mela ground in Kolkata. During the Rath Yatra & Mela organized by ISKCON in Kolkata, people would get the chance to pull the rope of Jagannath Ji’s Chariot to get blessings from the Lord. This is the chance for beautiful darshan of Lord riding the chariot and to make your Puja. Kirtan, Maha Prasad & fair for youth will be arranged as well by ISKCON. Path / Route of ISKCON Rath in Kolkata - The ISKCON Kolkata Rathyatra will follow the route as follows - Park Circus (Suhrawardy Avenue) > CIT Road > Moulali crossing > S.N. Banerjee Road > Dorina crossing > J.L. Nehru Road > Park Street metro station > Outram Road > Brigade Parade Ground. Route for ISKCON Kolkata Ulta Rathyatra - Outram Road > J.L. Nehru Road > Chowringhee Road > Exide crossing > ATM Road > S.P. Mukherjee Road > Manohar Pukur Road / Ramesh Mitra Lane > Sarat Bose Road > A.J.C. Bose Road > Hungerford Street > Iskcon Kolkata Temple. Those who unable to attend the venue of ISKCON Rath Yatra in Kolkata; may watch ISKCON Rath Yatra Live on television channels sitting at home. Watch ISKCON Rath Yatra 2011 Online - Video courtesy Youtube. Search Tags: ISKCON Rath Yatra Mela venue location details, ISKCON Rath Yatra Mela Kolkata starting ending dates schedule timings, ISKCON Rath Yatra Mela Kolkata features facilities details, ISKCON Rath Yatra Mela Kolkata exhibition entry timings ticket charge ISKCON Rath Yatra Mela Kolkata 2012. Watch live online Kalpataru Utsav from Cossipore Ramakrishna Udyanbati, Dakshineswar Kali Temple Kalpataru Utsav Live Online, Details of Kalpataru Utsav Program Chart List Dakshineswar & Cossipore, Watch Live Videos of Kalpataru Utsav of Udyanbati Cossipore & Dakshineswar Kali Mandir, Train timings bus routes to Dakshineswar Kali Temple & Cossipore Udyanbati. Thousands of tourists come to Dakshineswar Kali Temple and also at Cossipore Udyanbati on 1st January of every day because of Kalpataru Utsav of Sri Sri Ramakrishna Deb. Not only at Kali Temple of Dakshineswar & Cossipore Udyanbati, Belur Ramakrishna Mission, Kamarpukur Jayrambati etc religious places those are known for Sri Sri Ramakrishna Deb, also attracts thousands of devotees, disciples & pilgrimages. Let’s check out the Kalpataru Program list of Dakshineswar & Cossipore Udyanbati details below. • 4:30am to 6:40am at Cossipore Udyanbati Kalpataru Utsav Program – Mangalarti, Usha Kirtan, Bhajan. • 7:30am to 3:20pm at Cossipore Udyanbati Kalpataru Utsav Program – Puja of Sri Ramakrishna Deb, Hom, Baul Gaan, Bhakti Sangeet, and program on Sri Sri Ramakrishna Lila Prasanga. • 5:35pm at Cossipore Udyanbati Kalpataru Utsav Program – Bhajan Sangeet and other cultural programmes. • 5am at Kalpataru Utsav Dakshineswar – Mangal Aarati of Maa Kali at Kalibari of Daksineswar. • 6:30am to 1:30pm at Kalpataru Utsav Dakshineswar – Chandipath, Bhakti Geeti, Geeti Alekhya program. • 4:30pm to 5:30pm at Kalpataru Utsav Dakshineswar – Special cultural programs and also programme on Ramakrishna & Vivekananda. • 6:30pm onwards at Kalpataru Utsav Dakshineswar – Bhakti Geeti program. Various Bengali Television channels will telecast Kalpataru Utsav Live from Dakshineswar Kali Temple & also from Cossipore Udyanbati Temple right from the morning on 1st January. Those who want to watch Kalpataru Utsav Live at home should watch Kolkata TV Channel, DD Bangla Channel & other Bengali Television Channels at 9am to watch live videos from Dakshineswar Kalpataru Utsav and don't forget to watch DD Bangla TV Channel at 7am to watch Kalpataru Utsav from Cossipore Udyanbati. For the convenience of visitors coming to Dakshineswar Kali Temple on 1st January (Kalpataru Utsav of Ramakrishna), Indian Railways will run all the Trains from Sealdah-Dakshineswar-Dankuni route along with few special trains. It means, all the trains that usually not run on Sunday & Holidays; on 1st January all these Local Trains will run from Sealdah-Dakshineswar-Dankuni & vice-verse. Apart from Local Trains towards Dakshineswar (Sealdah-Dankuni Local Train Timetable), there is no shortage of Public & Government Buses from various locations of Kolkata & Bengal towards Dakshineswar & Cossipore. Enjoy your religious tour to Cossipore Udyanbati & Dakshineswar Kali Temple on Kalpataru Utsav 1st January and don’t forget to make your wish to Sri Ramakrishna Deb on this Kalpataru Day. Visitors would visit to Adyapeath Temple of Dakshineswar, Sarada Math of Dakshineswar, Yogoda Math of Dakshineswar by Rickshaw from Dakshineswar Kalibari and could make a trip to Belur Math by boat from Dakshineswar Kali Temple Ganga Ghat or by Bus from Dakshineswar to make their Religious tour more memorable. Haj Application Form 2012 Download, How to apply for Haj Festival tour from India, Application process of Haj Pilgrimage Tour 2012, requirement fees application form of 2012 Haj Pilgrim, Contact address phone number of Kolkata Haj Office. The intending Haj Pilgrims of West Bengal are hereby informed that only International Passport holders can apply for Haj Pilgrimage 2012 and they are required to submit their Haj Application Form 2012 along with the passports as per the latest rules by Haj Committee of India. All the pilgrimage should have their valid international passport when they apply for Haj-Pilgrimage from 2012 onwards and this rule includes infants, kids as well. The aspirants of Haj Pilgrimage 2012 Yatra shall submit the original passport at the time of Haj 2012 application itself. Haj Committee of India appeals to all the intending pilgrims to get their passport ready even for Children & Infants before the announcement of Haj 2012 (likely in February 2012). Remember, no application will be considered without the original passport. Please make sure that the expiry date of your passport is not before than 31st March 2013. So, please contact West Bengal State Haj Committee Office (address mentioned below) as soon as possible before the Haj 2012 Application Process starts. • West Bengal State Haj Committee Office Address in Kolkata - Govt. of West Bengal, Writers' Building, Ground floor, Block 1, Kolkata–1 (Phone number : 033-2214-3310). • Haj House (Baitul Hujaj) Kolkata Address - 26B Dilkusha Street, Kolkata-17 (Phone number: 033-22807155). • Haj Committee of India Head Office Address – Haj House, 7A M.R.A. Marg, Palton Road, Mumbai-1, Maharashtra, India. • Haj House Helpline phone number of Kolkata, West Bengal: 033-2282-0678 / 033-2282-0679. Check further information on Haj Pilgrimage Tour 2012 Application Procedure of West Bengal State Haj Committee at www.hajwb.com/bn/contact.php website and you can Apply Online for Haj-2012 by filling up Online Haj 2012 Application Form at http://hajcommittee.com/ website of Haj Committee of India. Jhargram Utsav 2012 Dates Schedule Timings, Attractions details of Jhargram Utsav, Best cheap low package tour contact address phone number of Kolkata for Jhargram Utsav 2012, West Bengal Tourism Centre tour package price expenses dates booking process Jhargram Utsav 2012. Christmas Holidays and Winter Seasons mean the tour & travelling season for us. We all in these days, normally look for cheap yet extraordinary tourist venues nearby Kolkata to have a short tour. Jhargram Utsav is one of those cheap tourist locations nearby Kolkata for spending only few days with full of entertainment. Jhargram Utsav details: Jhargram is situated in Paschim Medinipur district of West Bengal and known for the Clay Arts, Adibasi Cultural programs etc. Every year in January 11th & 12th (date of Jhargram Utsav 2012) celebrated at Jhargram through the exhibition of Arts of Medinipur, Purulia, Bankura and with Aadibasi Dance & Folk Music. It’s worthy enough to visit Jhargram Utsav to get the flair of Bengal’s culture and folk songs from the mouth of Aadibasi people. Jhargram Tourist Spot of West Bengal can be reached easily from various parts of Bengal and outside by Train Routes, Bus routes and also so many Tour & Travel Agencies of Kolkata & Bengal provides cheap tour package for Jhargram Utsav every year. But it’s always recommended to tour with authorized tourist service providers and the details of authorized tour operators of Kolkata & Bengal has been mentioned below. West Bengal Tourism Office address: 2 Brabourne Road, Kolkata. Phone number of West Bengal Tourism Department: 033-2225 4723. West Bengal Tourism Centre provides the exclusive tour to Jhargram Utsav every year and those who want to book tour packages of Jhargram Utsav at WB Tourism Office should contact at 3/2, B.B.D. Bag (East), Near to Steffen House, Kolkata-1 or just Call at 033-22437260 / 033-44012659 numbers or visit at www.westbengaltourism.gov.in website for getting the information about the Jhargram Utsav Tour Package Price and dates. Durga Puja is the main festival to the Bengali community and largely celebrated in Bengal and in recent days Durga Puja is celebrated worldwide by the Bengali Communities. Durga Puja starts from Mahalaya (i.e., Tarpan Tithi) seven days prior to Durga Panchami Tithi. Here is the detail date, time schedule, Puja nirghanta of Durga Puja 2011 (1418 as per Bengali Calendar), Mahalaya, Sandhi Puja etc. Generally in Hindu Shastra, ‘Tithi’ depends on Moon rising and setting down. Mahalaya 2011 (Bengali Calendar 1418) is on 27th September 2011 (Tuesday) / 9th Aashin 1418. In this day of Mahalaya, the 'Torpon' is to be done. Durga Panchami Puja 2011 (Bengali Calendar 1418) is on 1st October 2011 Saturday / 13th Aashin 1418 from that day 7.52 am to next day 5.45am. Durga Shashti Puja 2011 (Bengali Calendar 1418) is on 2nd October 2011 Sunday / 14th Aashin 1418 and "Kalparambho" should be done within 9.28am and Durga Devi Bodhon (Amantran and Adhibas) in the evening from that day 5.46am to next day 3.54am. Durga Saptami Puja 2011 (Bengali Calendar 1418) is on 3rd October 2011 Monday / 15th Aashin 1418 and "Nabo Patrika" puja should be done within 9.28am, Predawn bathing of Kola Bow time schedule is from that day 3.55am to next day 2.22am. Durga Ashtami Puja 2011 (Bengali Calendar 1418) is on 4th October 2011 Tuesday / 16th Aashin 1418 and the most important Durga Sandhi Puja timing is 12.51am to 1.39am (Sacrifice - 1.15am) from that day 2.23am to next day 1.15am. Durga Nabami Puja 2011 (Bengali Calendar 1418) is on 5th October 2011 Wednesday / 17th Aashin 1418 from that day 1.16am to next day 12.35am. Durga Dashami (Bijoya) Puja 2011 (Bengali Calendar 1418) is on 6th October 2011 Thursday / 18th Aashin 1418. Durga Maa arrives on Elephant, which means good harvest and departs on Palanquin that signifies an outbreak of epidemic. Search Tags: Durga puja 2011 timings schedule, 1418 Durga Puja date time nirghanta, Durga Puja sandhi puja mahalaya bodhon timings 2011. Like every year; Guru Ganga Old Age Home of Dakshineswar, Kolkata will be organizing the Annapurna Puja 2011 at their Old Home Campus. The date of Annapurna Puja 2011 is 11th April 2011 and you all are welcomed to Guru Ganga Old Age Home, Dakshineswar Kolkata on that precious Annapurna Puja date. The Annapurna Puja in Kolkata’s Guru-Ganga Old Age Home in 2011 will commence from 10am morning and there will be Kumari Puja, Bhakti Sangeet and at last in the noon Bhog Prasad distribution. Please collect Bhog-Coupon from counter on payment of Rs.30/- on Annapurna Puja, Kolkata. Next day on 12th April 2011 after the puja of Annapurna Maa, Ramnabami Puja will hold and in the evening the idol of Maa Annapurna will be taken to Ganga Ghat. For further details on Annapurna Puja 2011 at Guru Ganga Old Age Home, Dakshineswar Kolkata please call 9830077714 (Anindya Bhattacharjee). As we all know Bengali celebrates lots of festivals in Kolkata and Bengal and this is why people use to say ‘Baaro Maase Tero Parbon’. Maa Saraswati Puja is one of the festivals that is celebrated in Kolkata and across Bengal whole-heartedly especially by Students because, Maa Saraswati is known as Goddess of Education and Music. Saraswati Maa is one of the daughters of Maa Durga and praised by Bengali Community every year during Basanta Season. In this year 2011 the Saraswati Puja is scheduled to happen on 8th February 2011. As per the Bangla Panjika, the 2011 Saraswati Puja Date is February 8, 2011. Normally, during the Basanto Season (Season before summer and after winter) Bengali people used to pray Saraswati Maa through Saraswati Puja. Goddess of Education Maa Saraswati also known as ‘Basanti Devi’ / ‘Sheet Subhra Bastra’ and normally Maa Saraswati wearing Saree (White or Basanti colored) holding Setaar (Musical Instrument) with a Dove. Since, Saraswati Puja at Kolkata and Bengal is of Students, we don’t see Saraswati Puja in Pandels beside Kolkata roads. Mainly in Schools, Colleges, and University students organize Saraswati Puja and also Kids / Students arranges Saraswati Puja at their own house. School-College-University Students usually does several cultural programs in Saraswati Puja Celebration 2011 at Kolkata and across Bengal. Starting from Songs, Abritti, Dance performances to serving Saraswati Puja Bhog Prasad to students are done during the course of Saraswati Puja 2011 in Kolkata and Bengal. Many Dancing or Singing Academies arranges annual program on Saraswati Puja 2011 Kolkata and Bengal’s renowned Stages. Saraswati Puja is also known as Bangali’s Valentine’s Day. Yes, this is the day in the year when Boys can easily visit Girl’s School / Colleges and also Girls can visit easily to Boy’s School / Colleges. As per the Bengali Culture in the Saraswati Puja Day Girls used to wear Basanti (or colorful) Sarees and Boys used to wear Pajama-Punjabi. In the Saraswati Puja in Kolkata and Bengal many love stories start. Nowadays, many Bangla TV Channels used to telecast Saraswati Puja of Kolkata 2011 live. So, stay tune to watch Live 2011 Saraswati Puja of Kolkata on Bengali Television Channels. What’s your plan in 2011 Saraswati Puja at Kolkata, Bengal? You can share your views on Saraswati Puja 2011 of Kolkata or Bengal by Posting now. Are you looking for the Lord Krishna & Radha Ji Photo or Radha Krishna Pictures or Sri Krishna Kanhaiya Gopal Muralidhar Photo or Radha Maa with Gopi Krishna Photos or Sri Krishna Radha Rashlila Ajodhya Mathura Brindaban religious places photo or Radha Krishna Prem Leela Photos? Check out few photos below. Sri Krishna Janmashtami Tithi is celebrated all across India especially in Mathura, Brindaban, Ayodhya and Mayapur of West Bengal through the holy songs, prayer to Lord Krishna. Krishna Janmastami Puja followed by Sri Krishna Nandotsav Puja also celebrated at Guru Ganga Old Age Home (Dakshineswar, Kolkata) through Bhog, Bhajan Kirtan and popular religious song Taaler Bora Kheye Nanda Nachite Lagilo. Gateway of famous Bengal Festival Durga Puja is Mahalaya, which is celebrated seven days before the Durga Panchami Puja every year, and the day of Mahalaya never changes. Jago Tumi Jago - Mahisasur Mardini - Durga Maa Agomoni - Mahalaya is known for inviting goddess Durga to the earth. Mahalaya observed in Bengal through Tarpan, which is a process of giving water to the family members who are dead, and inviting Maa Durga, the Goddess of Power. It's nearly six decades from the creation of Mahalaya Stotra by Birendra Krishna Bhadra. Bengalese rise up around 4am in the morning and tuned to Radio to listen Mahisasur Mardini by Birendra Krishna Bhadra every year on Mahalaya. It's happening from 1930 when for the first time from Maa Chandi Kavya been translated to Mahisasur Mardini (English meaning The Annihilation of the Demon). Mahalaya Stotra Ya Devi Sarba Bhuteshu & the Story of Mahisasura Mardini tells how Goddess Durga formed by Bramha, Bishnu and Maheshwar and how Maa Durga protects the Earth by killing cruel demon king Mahisasura. If you are searching for Mahisasura Mardini Mahalaya Song of Birendra Krishna Bhadra, then please check out Mahalaya by Birendra Krishna Bhadra.